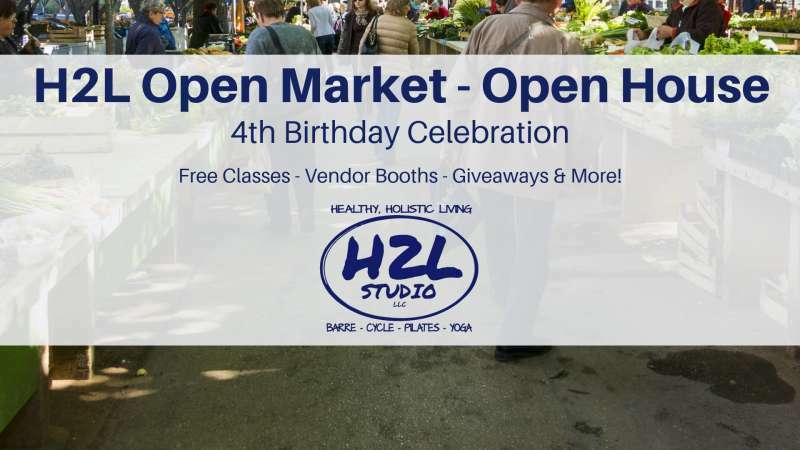 In honor of H2L Studio's 4th Birthday celebration, we invite you to be a part of our first ever H2L Open Market. This farmers market meets wellness fair event will take place in and around our studio. 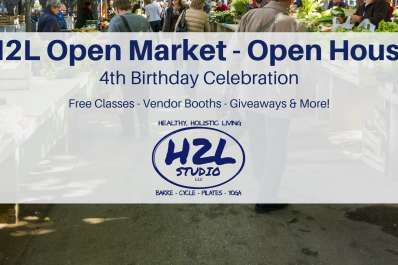 We'll have free classes, vendor giveaways and more! Saturday, April 27th 8 am-1 pm (rain date May 4th). Here's our schedule for the day -- sign up online early as we expect classes to fill! First-time visits are $5 for the regular rates apply classes. 9am: TRX Express (Regular rates apply) - Heather E.
12pm: Beginner Cycling FREE - Heather E.
We are still working on growing our vendor list but here's who is coming as of now! Holistic Hearts -Expressive Paint Parties, Fleet Feet, Blind Nut Butters, TIEM Cycling Shoes, Enchanted Realms, Athleta, Natural Awakenings, Stone Harbor Fitness Retreat, Doterra Essential Oils, Natural Path to Wellness, Norse Naturals, Healthy You Cafe, Vein & Ester Soaps and more!